Whether you use a Warping Board, Warping Paddle, Warping Mill or need components to do Sectional Warping, Camilla Valley Farm Weavers' Supply carries a broad range of quality warping tools and accessories from Leclerc to make your job easier. 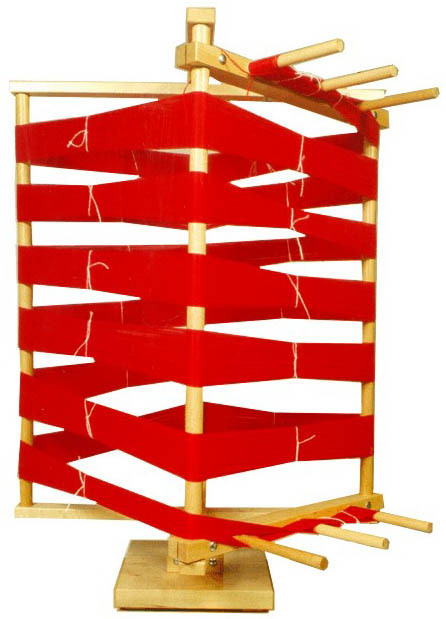 The Table Model (shown at right) gives 2 yards (1.8 metres) per rotation and can warp up to 22 yards long. (Height: 38 inches (96 cm), Width: 26 & 1/4 inches (67 cm). The Floor Model (shown at left) gives 4 yards (3.7 metres) per rotation and can warp up to 50 yards. (Height: 68 inches (173 cm), Width: 59 inches (150 cm). 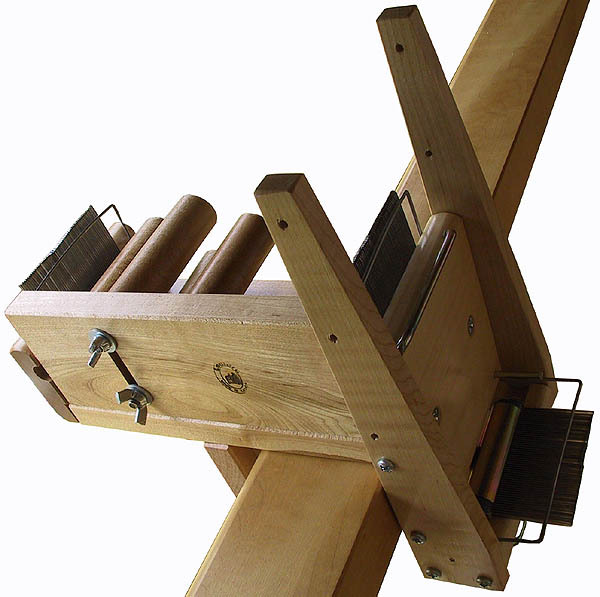 Note: As well as being a very flexible Inkle loom, the Leclerc Cendrel Loom can also be used as a tabletop warping board and is an alternative for those weavers looking for a multi-functional piece of weaving equipment. To reduce the time involved in creating a warp and the threading it on, sectional warp beams allow direct warping onto the loom from spools or small bobbins. It is especially appreciated by the weaver who has no helper because it can be beamed easily by one person without help. 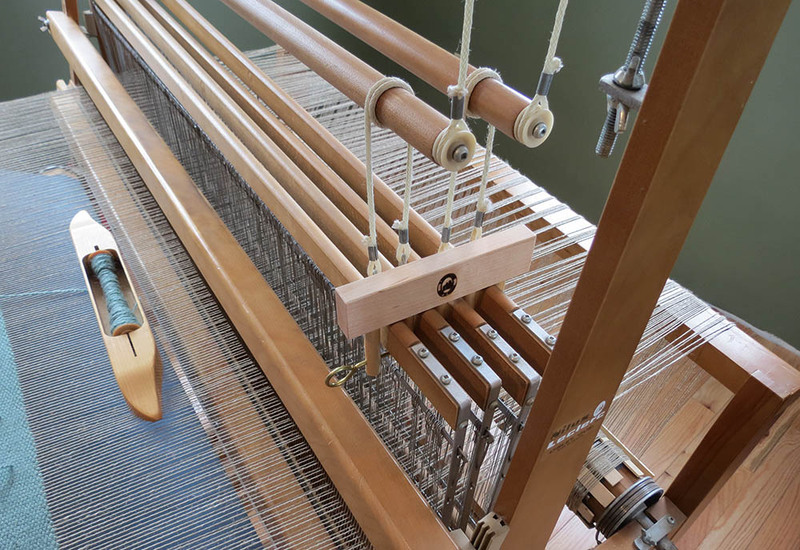 The Leclerc system consists of 4 rake-like pieces that are attached to the plain beam on the loom or to the double warp beam (see picture below). It allows beaming 1" (25 mm) or 2" (50 mm) wide at a time and requires a number of spools according to the sett of warp ends. 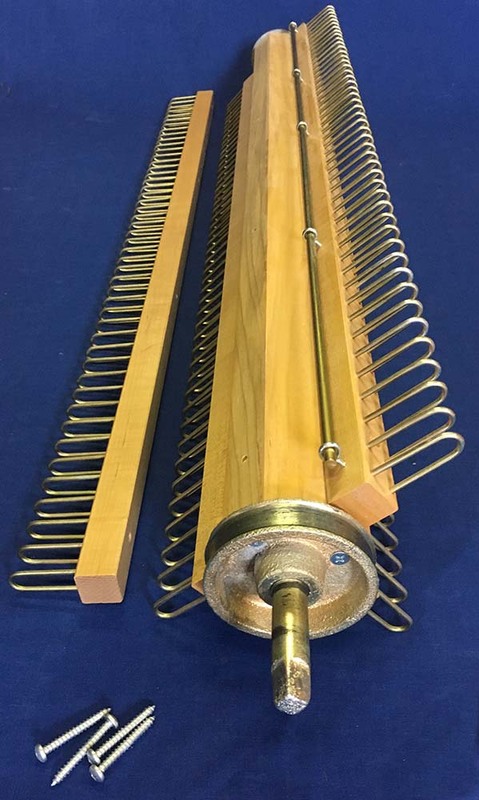 The metal Warp Rod shown in the picture that is used to tie the warp threads to, is not included with the rakes as a warp rod included with the loom is used and threaded through the set of Screw Eyes mounted on one of rakes. Note that additional metal Sectional Beam Brackets can be purchased to convert all or part of a rake from 2 inch to 1 inch spacing. 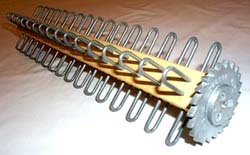 On the 24" Dorothy or Voyageur table looms, the cramps are fixed directly on the warp beam requiring the purchase of a special sectional beam as shown below. The beam also includes a temporary breast beam for these table looms that allows the Tension Box to be attached. Note: Metal Sectional Beam Brackets are available individually to repair broken brackets or convert a rake beam with 2 inch spacing to 1 inch spacing. This kit provides the components needed to add warp capacity to standard Leclerc Sectional Warp Beam to one that provides 1 Yard (48 cm) per turn. The components in the kit raises the 4 Sectional Warp rakes off the warp beam to create a Sectional Beam with a larger larger diameter to increase its capacity. Each kit contains a set of Maple hardwood dowel extenders that are inserted between the warp beam and the sectional rakes. On some of the wider looms, wooden blocks are also provided to support the sectional rakes between the dowels. Used with the Sectional Warp Beam, this Tension Box is adjustable to fit any LeClerc Floor Loom. 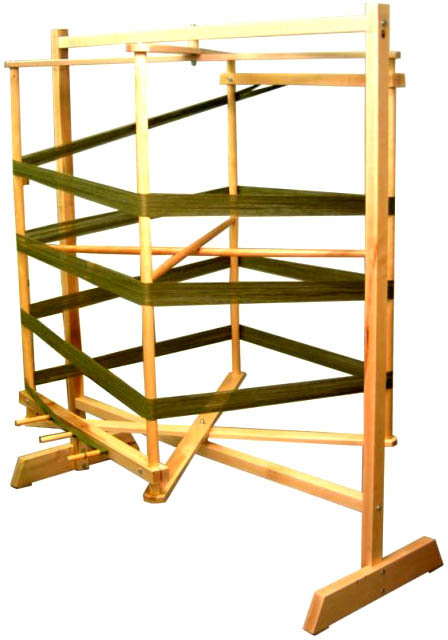 It provides a uniform adjustable tension on all warp ends as they are wound from the spool rack to the loom. Two open combs allow easy threading and help guide threads into the proper section. 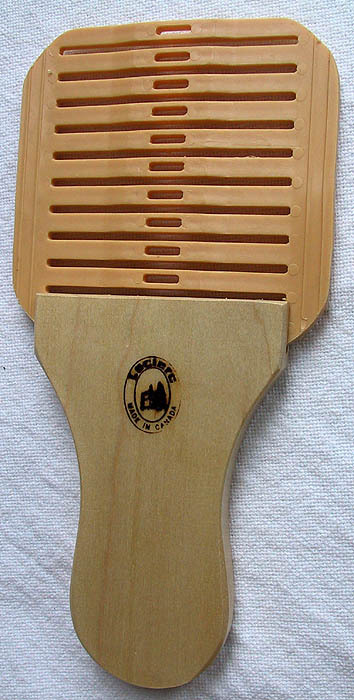 A wire guard locks in place over each comb to keep the threads from coming out. The tension box comes with a pair of 12 threads/inch (4.8/cm) combs but other sets may also be ordered below. The Tension box has been recently updated with 4 rollers for better tension control and a unique locking mechanism to allow it to be quickly attached to and removed from the loom's warp beam. A round knob at one end can be turned to open and close the padded "jaws" on the bottom that clamp to the warp beam. The Tension Box can also be used with the counter below when winding bobbins to hold the threads and to measure the length wound on in yards or meters. Mounted on the Tension box (shown above), this Counter measures the length of the warp to ensure that all sections are the same length. 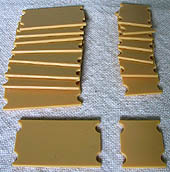 The wood bracket attaches to the tension box with two screws (included) and the actual counter mechanism can be easily removed from the tension box and/or adjusted by simply loosening the wing nut shown. 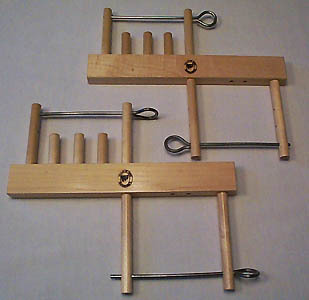 A Set of 8 extenders that fit on the steel divisions for each section of the sectional warp beam. They prevent the warp ends from going into other sections or from staying on top of the divisions. When the section is filled, these are simply transfered to the next section. Two of these combs are mounted in the tension box to keep the yarn separate coming in from the bobbins and going out to the loom. These are made of stainless steel for durability and rust prevention. 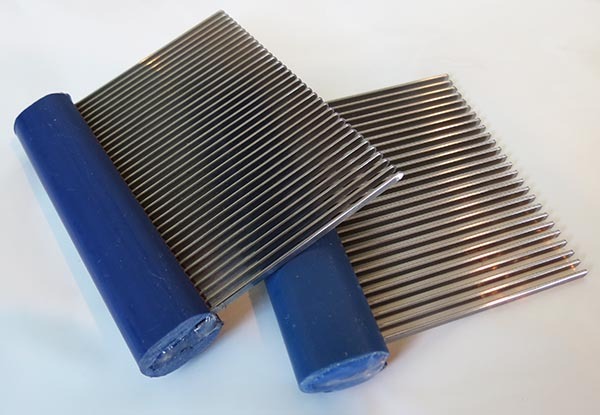 Combs are available in 4, 6, 8, 10, 12, 15, 16, 18, 20 and 25 dents/inch sizes. Please indicate the size in your order. 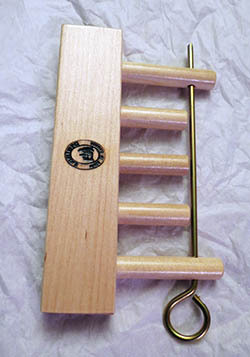 The Leclerc Warping Paddle is used for warping with more than 4 ends (up to twenty threads) at once onto your warping board or warping mill (reel). The cross is made easily by sliding the yarn up and down in the slot. Some good books that explain how to use a warping paddle are Winding a Warp and Using a Paddle - Peggy Osterkamp's New Guide to Weaving and Leslie Voiers' Winding Multi-Colored Warps with a Warping Paddle. These multi-functional "helpers" are like a second hand for a weaver! Used as a shaft stabilizer and a support for the lease sticks and raddle, these threading helpers hold the cross at a convenient height during the threading process. 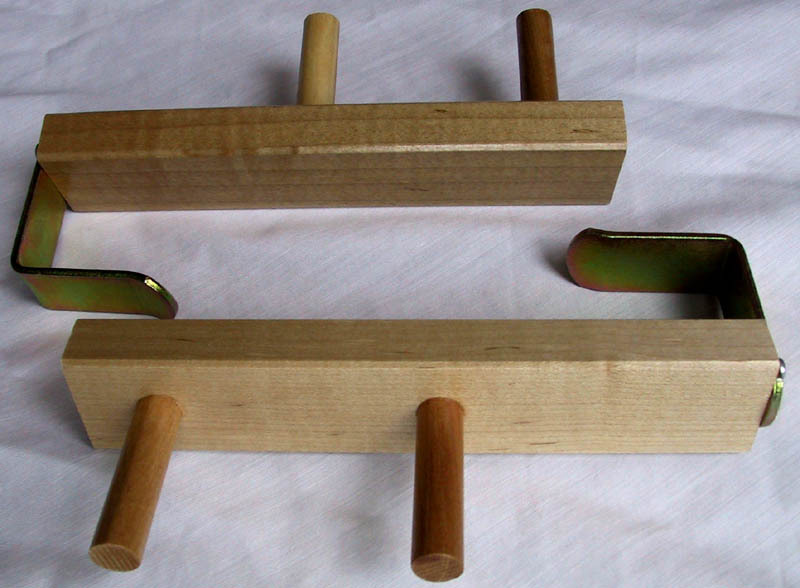 Like the Shaft Stabilizer, they can also be used to lock the shafts in place and can be used behind the loom. These Threading Helpers are a more functional version of what some weavers refer to as "Angel Wings". 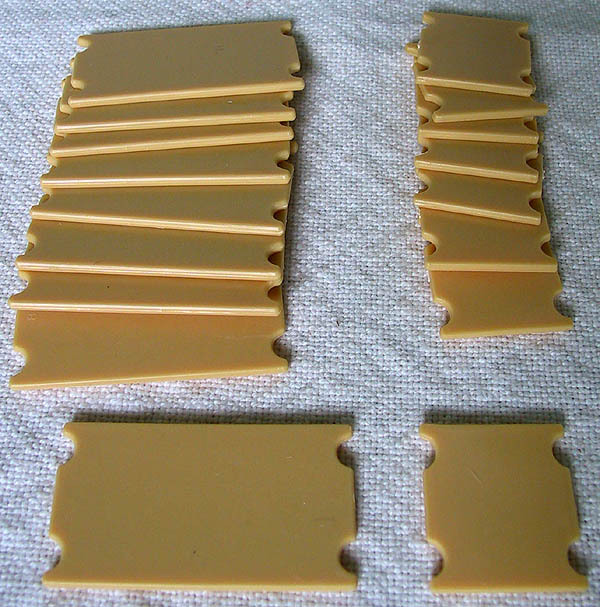 They can attach to the shafts as well as the breast beams and can hold lease sticks and/or raddles with 4 slots and can be used at the front and the back of the loom. 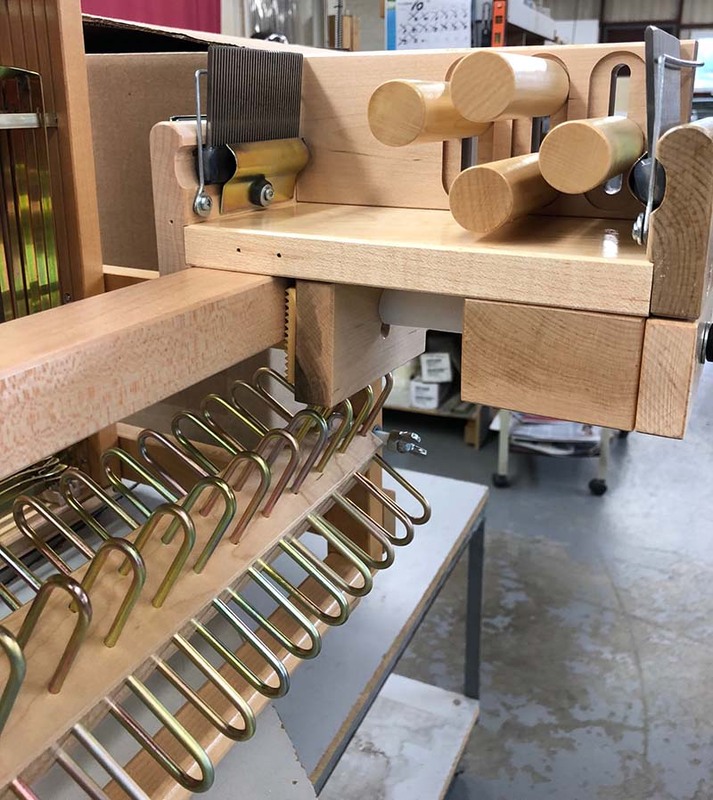 The ability to lock the shafts in a neutral position is a very handy tool when using a counterbalance loom and the easy to remove metal locking pins are designed to fit Leclerc looms perfectly. Also, the ability to add or remove lease sticks by just lifting them vertically means weavers with looms in small spaces don't have to provide clearance on either side of the loom like other designs! 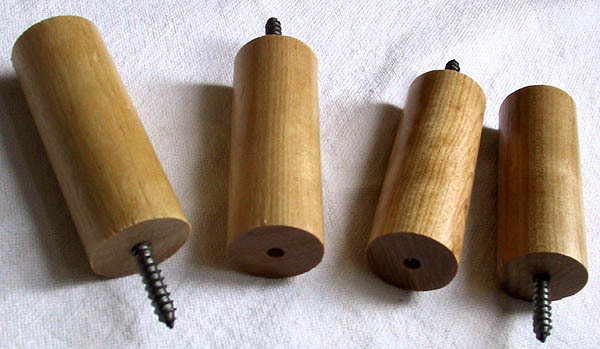 Made out of hardwood, a single Shaft Stabilizer is all that is normally required.